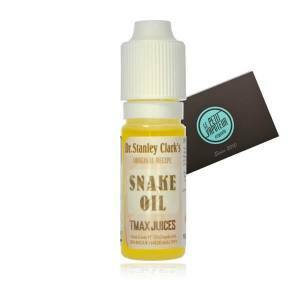 We recommend to you Snake Oil produced by the English company TMAX juice. 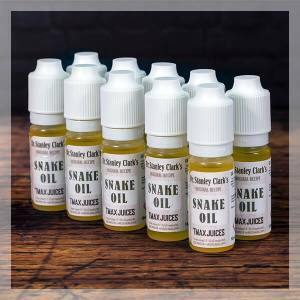 Snake Oil is an e-liquid that will awaken your senses with its complex mix of citrus fruits with a touch of liquorice-aniseed. 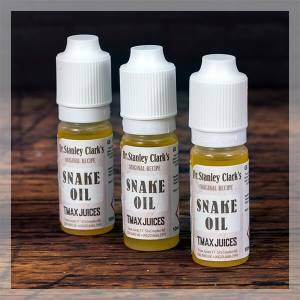 Snake Oil will surprise you with its freshness. To taste today! 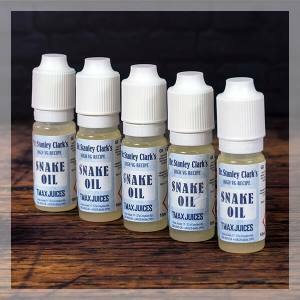 FIESTA Snake Oil 10 x 10 ml ! The Snake Oil is an E Liquid by T-Max Juice, a British Company with a reference in the domain of manufacturing the liquid for the Electronic Cigarette. 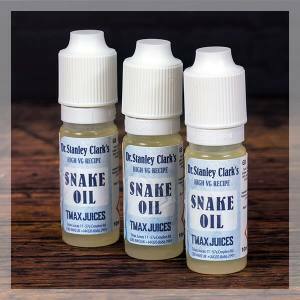 The Snake Oil is a mixture of unique and « ultracomplex » with a base of Citrus Fruits and a hint of Aniseed - Liquorice. Because this e liquid by T-Max Juices is adored and particularly consumed by confirmed vapers, it proposes numerous formats (1, 3, 5 or 10 bottles in 10ml) and have a nicotine dosage of (0, 6, 12, 18mg): but also, the classic version in High VG to correspond with the needs of amateurs, allowing you to economise. If you are an enthusiast of the T-Max Juices, you should discover the E Liquid Sands of Time, loyal successor of the Snake Oil E Liquid. With a taste of unctuous Lemon and subtle hints of Flowers, this new product is available in 40% / 60% PG/VG or 20% /80% PG/VG in 0, 3 and 12mg/ml in Nicotine. In the process of dethroning the Snake Oil E Liquid, this may be the new best-seller of the range T-Max Juices.